Team Jets head coach Linda Andrews says errors from her side cost them the chance to beat unbeaten Premier League Two leaders Tameside. The Jersey side lost 52-45 to the Manchester-based team, despite leading 22-21 at half-time. "We gave our all, there were some really good passages of play, but there were a few errors which let us down, which is so maddening," said Andrews. "We had it in us to win it, but there were just a few unforced errors." Jets were five goals down at one point in the final quarter before getting to within one goal of their opponents - only for Tameside to again pull away, denying Jersey a losing bonus point. 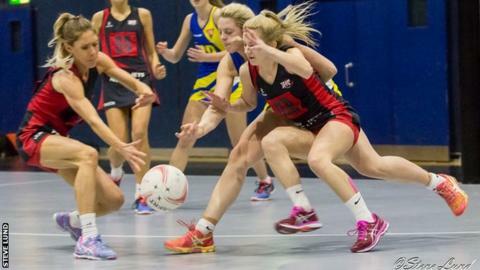 "We can analyse the performance and say 'yes, that might have been our best performance over probably two and a half quarters', but those little errors that came in have lost us that extra bonus point, which I know the girls will be really mad about - but that's game of netball," Andrews added to BBC Radio Jersey. The loss was a second successive defeat for Team Jets, leaving them fourth-from-bottom of the division.